What an amazing day! 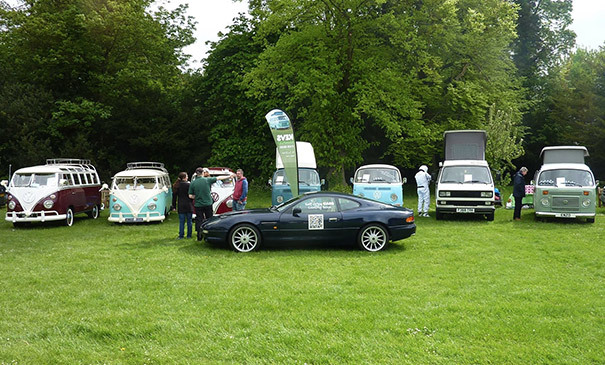 This was our 4th year at the Festival of Transport. It’s a free family motor event. Lots of different vehicles from bygone ages, stalls, bouncy castles – you name it, it’s there. 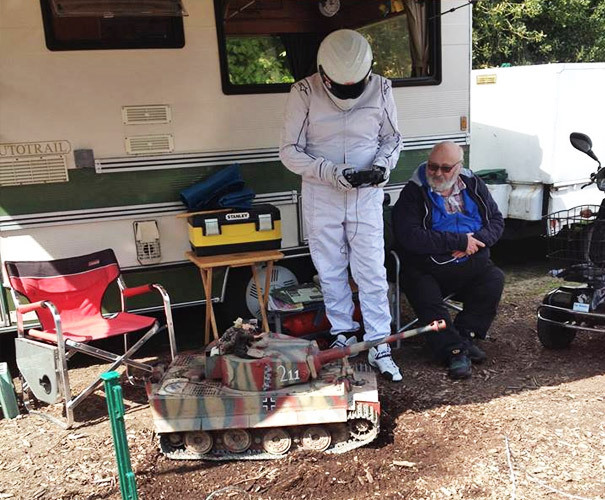 Even The Stig! It’s always a bit chilly setting up at 7am, but with Enzo and his pals, the kettle is never far away. A few of us congregated at the gate. Bluebelle, Jemima, Freddie & Hermione were early birds and beat Kevin & Maxine to it (again). Once everything was in its place, porridge, croissants, tea and coffee demolished, it wasn’t long before the vans started to attract attention. We’d fanned them in age order from 1966 splitties Honey & Bluebelle, 1967 splitty Katie, early bays 1970 Hermione & Jemima, then 1989 Joker Freddie and finally 2008 Brazilian bay Enzo. The Aston Martin at the front belongs to Grooms Day Too and was highlighting the fact that we’re going to start self drive classic car hire too. Thank goodness we had owners Alan, Marcus, Richard, Kevin (another one), Jacquie & Ed to help as the onslaught of visitors was relentless! We loved it! So did the vans. The campervan shortbread made specially for us by Helen at A Basing Bakes sustained us though. As usual Stig misbehaved himself taking over control of at tank!! But Bunny kept him in check and at least he didn’t scare any children this year. The draw for the half price hire was incredibly popular with Kevs Kamper team member Bunny & Bluebelle owner Alan in competition to collect the most slips. (sorry guys – we didn’t count them) The lucky winner, Matthew Turvey was announced on Monday night. So, with sun & wind burnt faces (again – we never learn) we packed up our campers and trundled off home. We’ll be back next year, so look out for the Basingstoke Festival of Transport at the War Memorial Park on the 2nd weekend in May.